My Creative Space today is trying to wrestle this sparkly tulle off the Bling Monster so I can make some flower filled fairy skirts in time for this weekend's Devonport Craft Market. My Creative Space this week is all about getting ready for the market. There's been a nice long break between the last market and this one so I've had plenty of time to come up with some new stock but of course, I have left it to the last minute yet again. I've been busy being a Monkey-Maker. 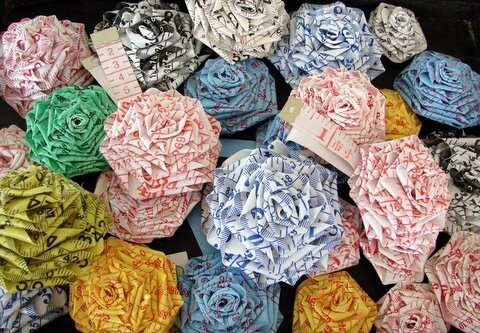 And as you can see, I've been making a few of my Tape Measure Rose Brooches too. I still have a pile of applique t-shirts to finish off but they will have to wait. Being a Mummy is taking prescendent today. There's Cross Country to watch at school and Girl Guide Biscuits to sell , not to mention thinking up Creative ways to wrestle the tulle off the Bling-Monster. Everything else is just going to have to wait. The weather isn't set to be great this weekend so if you aren't coming to visit me at the Devonport Craft market, have a look at yesterday's post which has a tutorial for making a tiny doll carrier bag ( which can be adjusted for carrying cars or boy's action figures). To see lots and lots and lots (take the day off, you'll need it) of amazing Creative Spaces, pop over to Kirsty's. Busy, busy! Love those monkeys! 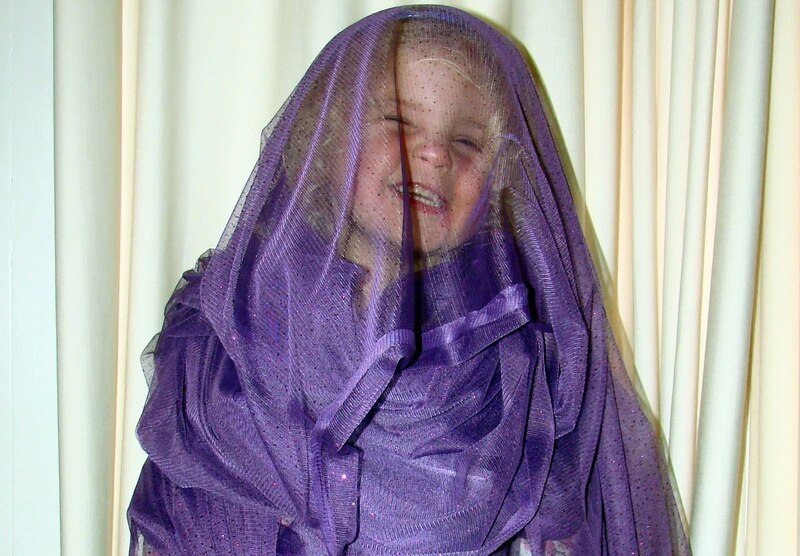 your daughter looks so happy ... can't she keep the tulle? LOL PS the monkeys are so cute and i always love your tape measure roses. you find so many interesting tape measures. 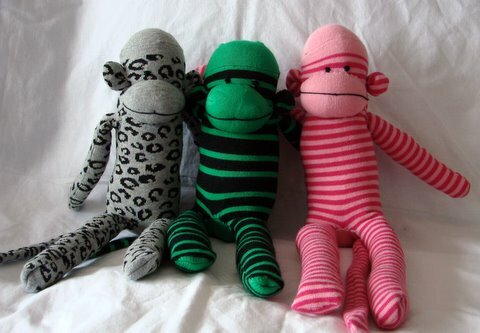 LOVE the monkeys - so cute! Is everyone used to your hair yet? sounds just like home before a weekend market. good luck at the weekend. the bling monster looks ecstatic. Love the navy and white brooch! Good luck getting everything ready. The monkeys look sweet (reminds me that I still need to put a few together for Saturday). Hope you get your sparkly tulle back - can you bribe her with a skirt? The monkeys! I'm in love with the monkeys! Soooooooooo sweet! Wow you have been busy!! Love the monkeys!! Good luck getting your tulle back, and hope all goes well at your markets! Wow it looks like you have ton of stock ready already. I do hope you find time to get all of the rest you want done in time. Love the grey monkey – so cheeky! Those three monkey's look like the might be a bit mischievous don't you think? good luck ~ i don't know how you crafty people do it, getting all this wonderful stuff ready on a deadline like that. your girl looks to be having much fun!! I think your market wares look fantastic. I hope you sell lots and have so much fun. Please take some pics for us of your stall. Busy, busy - I love the tape measure brooches! Best wishes for the market!